Your new kitchen represents a large investment so it is right that it should stand the test of time. To this end your choice of worktop is particularly important. Your worktop needs to be durable, practical, easy to maintain and stylish. This is where quartz and granite worktops stand out. Natural stone worktops not only meet all these criteria but are beautiful, durable, scratch resistant and extremely practical. Quartz (quartz composite) is a man-made material and contains 93% natural minerals. It is a great alternative to natural materials. When comparing quartz and granite worktops, their qualities are rather similar, but not identical. One advantage of quartz is its uniform structure and the wide choice of colours available allows you to personalised your kitchen. Perhaps one of the most popular is white quartz as there is no pure white granite available in nature, however the many shades and colours available makes it easy to combine them to create your own stunning design. Granite is a rock formed from cooled magma and has its own unique natural colour, character and beauty. Generally granite rock is patterned and the overriding content of light coloured minerals it contains creates the impression of a light surface. 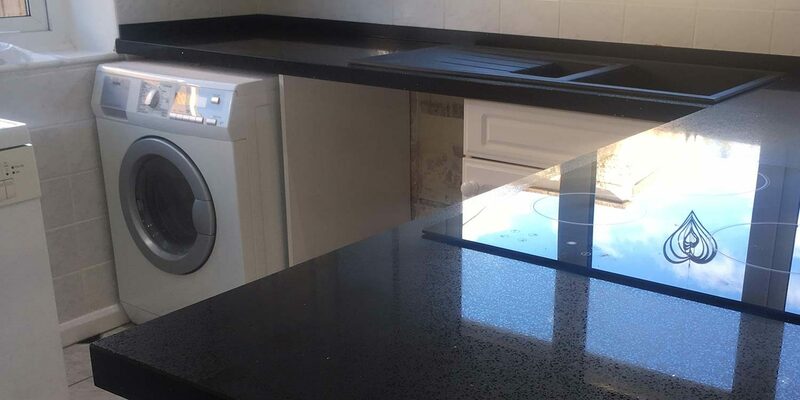 Granite may have pink, red, brown, grey, black, or occasionally white or blue veins running through it which service to embellish the final appearance of your kitchen. With excellent resistance to heat and cold, granite is ideal to use in your kitchen – hot pans and ovenware can be placed directly onto the worktop. Granite is hard and not easily damaged in the course of daily use; however it is not completely unbreakable and can be damaged. Midland Worktop Fitters provide an onsite Quartz and Granite cutting service. If you have bought a new Quartz or Granite worktops, or are revamping your kitchen and need someone to give you some advice on how to do this without damaging your worktops midlandworktopfitters.co.uk will be glad to help. Midland Worktop Fitters can enlarge hob and sink cut outs and drill new holes for taps, and we do it all onsite. We can fabricate your worktops at your premises and then install them, normally within one day. If you would like more information about our onsite cutting and fabrication services please contact us and we will be glad to discuss your requirements and options.